If you have any friends who love cats and you happen to have a wicked sense of humour, gift them this book. That’s as much as I’ll say on the subject! The latin name for the apple tree is a curious choice of title for a book about a witch hunter. The exact reasons behind the choices are clever, and I won’t spoil them, but I’ll say that herein lies the first compliment: this is a book full of horror tropes, each with it’s own slight twist on them, pulled off quite deftly by an author who clearly knows the genre and can write in it very effectively. 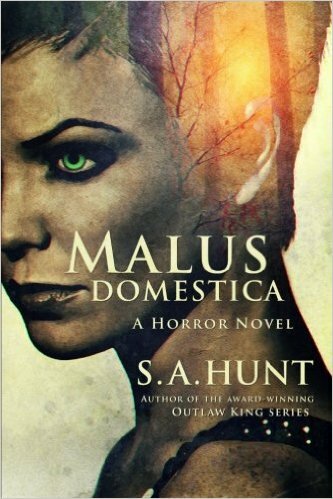 S A Hunt’s descriptions are in places the stuff of five star reviews rather than four – and I did deliberate over the rating for a while, because this book does walk the border. When the action really gets going, there’s no shortage of creativity in describing the violence – and there is plenty of it in this book! At times I felt like the narrative was (rather like Stephen King’s ‘IT’) stuck in a grey area between a YA style and horror written for adults, but in the end the adult content always wins over – proof that you can have young characters in the spotlight for a good length of time and not lose the adult reader. Robin Martine is a compelling protagonist. This is very much a ‘battle your demons’ book in two senses of the term, the literal and the metaphorical, and many of the characters around her do this, but she’s still the main show. Which is why I wished at times that the focus didn’t shift from her so much and onto the others. I can see it was necessary, and there’s more than one person with a story to tell in this book, and there’s a great section at around 60% where other people get their turn at being the hero in a hail of blood, fur and acid – a great piece of horror writing if I ever saw it, but I did get impatient for Robin to get back in the helm, and by 70% I was thinking ‘Just get ON with it!’ Then up come a new set of characters who to me served more as a plot device than people I really cared about, and the whole book started to get weighed down with too many people crowding the scenes. That said, the climax of this book is one I wish I’d written – it’s a perfect use of what I’ve taken to calling the ‘Cape Fear climax’ (after the film). What I mean by this is that the action in the main story is largely sporadic, coming in bursts with long sections of buildup pot-boiling between, but when you eventually get to the climax, you’re rewarded with all the extremes you could want, and there’s the ‘just when you thought it was over’ touch. I thought I was being nicely baited for a sequel and then something unexpected happened. If you like those sorts of surprises, read this book. Why not award the five stars then? It’s really down to two things. First, the whole book got too caught up in the popular culture references. Some of it was fun. Some of it, I fancy, was neat little nods at other things I’ve read or seen without names mentioned, and I get that the author is clearly as into a lot of this as his characters are, and it’s fine to show off your appreciation, but I felt like the author’s own story and characters were more interesting to me than half the superheroes that got mentioned. I can’t really wave the ‘Do something of your own’ flag, because S A Hunt clearly has done this, but too much lampshading is like a bit too much pepper. Secondly, the exposition when characters dismantled some of the clichés in the witch/supernatural genre also got a bit too long, even if they did provide what felt like an adult version of Buffy and Giles going through the books and the ancient knowledge (and I liked a certain amount of this, before I sound too critical.) When it comes to the narrative getting a little weighed down like this, there’s also a fair amount of character bonding that made the run-up to the action a little too long. There is some depth added to this, but if you’re after a page turner you might have to be prepared to slow down a little while you take it all in. I don’t know whether this is crit or praise, but I wonder if this would shine more as a movie than it does as a book. But shine it does, and the ending is particularly satisfying. If you enjoy your vices, have a shot of vodka and a Marlboro ready for when you’ve finished the last 5%. You’ll know when you get there! I’ve put this on my good reads list! I was immediately drawn to the title because I know the book used to hunt witches during the witch hunts was called the Melleus Malificarum. Any link there? Okay, don’t tell me. I’ll add it to my “to read” pile! Also Tommy, you should join Goodreads. It will revolutionise the way you organise your books!